Ken Starr discusses the 2016 presidential election and Russian collusion. WASHINGTON — Former independent counsel Ken Starr said on Wednesday he believes there is no evidence that the Trump campaign colluded with Russia to win the 2016 presidential election. 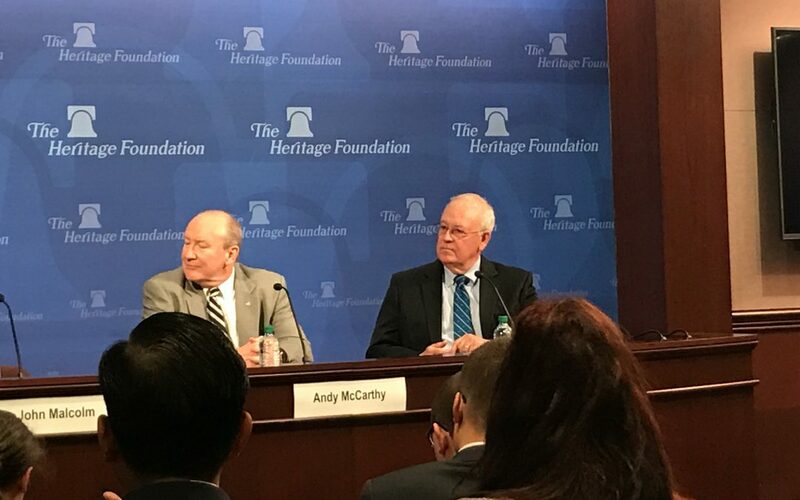 “the natural inference is no collusion,” Starr said at a talk at the conservative Heritage Foundation.. He said some people in Trump campaign may have been “duped” by Russians. Starr also said that Mueller should refrain from issuing indictments in the weeks before the midterm elections. “You try your best not to interfere with the democratic process,” Starr said. Starr was appointed to investigate President Bill Clinton over the Whitewater scandal in 1994. It involved a failed real estate venture by the Clintons and some associates in Arkansas in which investors said they were defrauded. Starr’s final report in 1998 focused instead on allegations that Clinton lied about an affair with White House intern Monica Lewinsky, which led to a House vote of impeachment. The Senate impeachment trial ended with a vote against removing the president from office. The former independent counsel also talked about the recent revelation that he almost filed indictments against Hillary Clinton during his investigation.